WARNING: Spoilers for BEYOND FATE may abound, so if you haven't read book three yet... well, don't say I didn't warn you! Her contemporary friends would ask about him, some out of romantic interest which she was swift to dissuade them from, some out of interest in her- the two of them could behave as if they read each other’s thoughts. Some saw in him a new boyfriend for their good friend, or competition for their attention, others just saw him. None suspected the truth. “Just admit it, Anna, he’s perfect for you,” her friend Marcus teased her one night. He was laying on her bed, trying to read the assigned text for the classes he had the next day. She was trying her best to ignore the homework she hadn’t done yet. “I’m not having this discussion with you right now,” she said firmly, unable to bring herself to deny what was an exact truth. Of course he was perfect. He was a god. “Of course not,” Marc replied mildly before dropping it and putting his nose back into his book. She shook her head. They would never understand how hard it was for her to love anyone else. And how pointless it was to pretend otherwise. She revealed little of what had transpired when Marcus found her still in bed, her cheeks puffy and flushed, her eyes red and swollen from her tears, he reached for her, and she went willingly into his arms. She crawled into his lap, as he was no small man himself, feeling herself to be much more fragile than she ever had before. Marcus wrapped his arms around her and pressed his lips against her temple. He sighed, heavily. She said nothing, but silent tears renewed their course down her cheeks. With one hand, he wiped them away with his thumb, peering at her face. He stroked her hair back, and she felt he understood the gist of it, if not the entirety. Poor Marcus had waited so long for her, she knew. He had stuck by her from the time when she had still told stories of her past lives. Then Thor arrived. She stared up at him, her eyes searched his, and following his thoughts as he worked up the nerve to finally act. He placed a finger under her chin, and tilted his head to bring his lips to hers. It was not the most confident of kisses, but she kissed him back, gently reassuring him that he had made the right decision. When, a month later, she went to him, confessing that she was pregnant, he didn’t seem to doubt for a moment the parentage of the baby. It was he, not she, who insisted upon a paternity contract, which would bind him to both her, as the mother, and the child, in legal guardianship. And when she looked at him thoughtfully for a very long moment before agreeing, she knew he believed it to be her evaluation of him as a parent, not her resolving to hide the true parentage of the unborn child. When the boy was born, he had a shock of thick blonde-red hair on the top of his head. She felt no resistance from him when she named the child Lars, she knew he thought his size unique, but considered it only to be some genetic throwback. When Anna agreed to become his wife, she knew he had forgotten Thor almost completely. He couldn’t have known, though perhaps he suspected during her more difficult moments, that she had not. The Source Material has a lot of big differences from the final version of the book (one of which being that all of this takes place on Jupiter's colonized moon, Ganymede, because I don't really know. I was obsessed with Jupiter's moons at the time I guess?) but ultimately, just like in Beyond Fate, Eve leaves Marcus for her son's sake. There are a couple more awkward scenes between them post-marriage and pre-abandonment, when Adam arrives unexpectedly four years later, and then Thor does, and Eve is forced to explain herself and her existence to Marcus, at which point he takes some time away to sort things out, and Eve leaves Adam behind to explain her departure to him (off-page) upon his return. It's all terrible, to be completely honest, which is why events got reshuffled and reorganized in the final version, but the important thing to know is that Marcus really had no defining characteristics. He was just filler. A stand in. As my friend Sarah might say -- he was kind of just a shoe. Boring but a necessary placeholder, I guess. *Disclaimer: I know, I know. Marcus was probably not your favorite character. To be honest, he isn't really supposed to be, so in that respect, I guess I did my job pretty well :) That said, I think he's fairly easily redeemable -- mostly I think it's his context as the friend-zoned "nice guy" who won't be brushed off that makes him unpalatable, but the role he plays is perhaps not entirely one of his own choosing (there is a Certain Goddess pulling his strings, after all), so I guess I kind of feel for him, when I otherwise would be 100% team GTFO with all of you. I hope, whether you tolerated him or hated him, you'll hang in there with me for the behind the scenes, regardless. 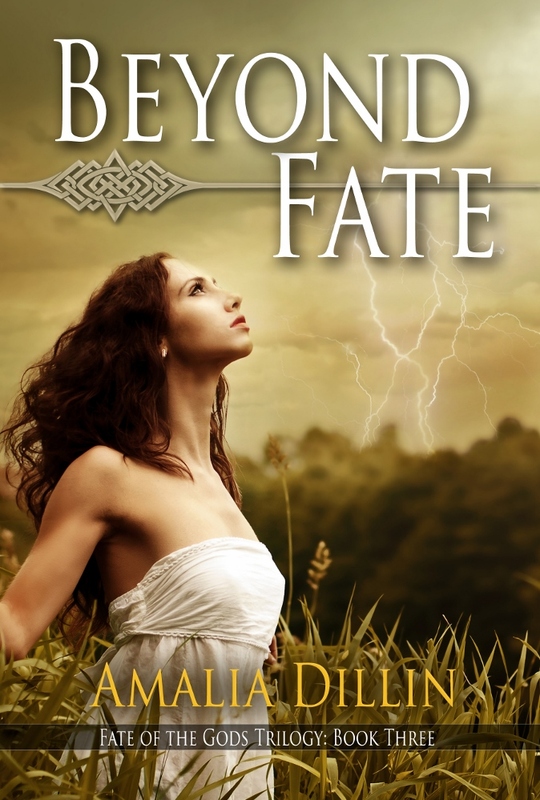 **FORGED BY FATE and FATE FORGOTTEN didn't get redrafted the same way BEYOND FATE did -- FORGED had a lot of false starts before I figured out the sequencing, but the book that was published was fairly close to the book that I submitted to WWP. I just reshuffled in some of the Thor chapters from FATE FORGOTTEN, which of course then meant that I wrote some additional Thor chapters for FF before its submission -- but BEYOND FATE's submitted draft was... problematic, and ultimately I rewrote the entire thing from the ground up as the most effective way to approach the revision requests from my editor. And I'm not even a little bit sorry, because it's a million times stronger than it was. But that also means I have a lot of lost scenes and stuff that never made it into BF because of the ways the story changed in the redrafting. Like all of Lars's development beyond toddler, and some interesting Adam and Eve moments that I still love, and a seriously adorable Thor and Eve and Lars at the dinner table scene. "No telepathy at the table, please!" omg all the hearts. ***This series is one I've been wanting to do for a while, in part just because I *can* do it, since BF had so many distinct drafts. But also because I think it's important to show that books don't always come out perfect the first try. Or even the second or the third or the fourth or or or. When I started writing Fate of the Gods, I was still learning my craft -- and it shows in my earliest drafts! Revisions and Edits are part of that learning process.